Mathilde Franziska Anneke (April 3, 1817 – November 25, 1884) was a German feminist, socialist, and newspaper editor, owner, and reporter. After she divorced her first husband, the ensuing custody battle over the children influenced her feminist views greatly. She later married Fritz Anneke, a former Prussian artillery officer, whom she had met in Münster, Westphalia, and the couple began publishing a daily newspaper for the working class in Cologne. When Fritz was jailed for his political activities, Mathilde continued to write, manage, and publish the paper until it was banned by the authorities in 1847. 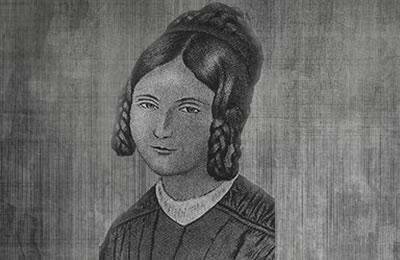 One year later, Mathilde started a new paper, the first German feminist newspaper, Frauen-Zeitung, in 1848. Upon his release from prison, Mathilde later travelled with Fritz during the Prussian invasion of the Palatinate, writing about it. After the Prussian victory, the couple fled Germany and immigrated to the United States. Upon her resettlement in Milwaukee, Anneke recreated her career as a feminist author and publisher, becoming a friend and colleague of Susan B. Anthony and Elizabeth Cady Stanton. In March 1852, Mathilde started the first feminist journal in the United States published by a woman, the Deutsche Frauen-Zeitung. Two key works of Anneke have been recently re-published in the United States in English translation: “Women in conflict with society” (a pre-1848 text on the fate of Louise Aston) and “Broken Chains” (a series of articles against slavery). Anneke published in German which was still widely used in the United States during the 19th century.